Achieve the highest flow rates from the most efficient RO system on the planet! Capable of producing more than 1,000 GPD or 42 gallon per hour of pure water. Remove 95%+ of all parts per million from your tap water. Save more water by running 2:1 waste to product water ratio. Includes custom KDF/Catalytic carbon filter for reduction of chlorine, chloramines, iron, sulfur and heavy metals - great for city or well water. Comes with all the necessary components for simple and quick setup. Welcome to the evolution of Reverse Osmosis. 1,000 gallons per day or 42 gallons per hour at standard line pressure. Reduces Parts Per Million (PPM) of Total Dissolved Solids (TDS) by 95%+. 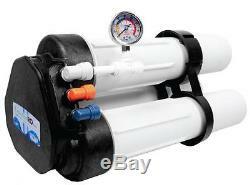 Standard 2:1 pre-plumbed (2 gallons waste/drain water per 1 gallon ultra pure water). Optional 1:1 ratio included (1 gallons waste/1 gallon ultra pure). (2) High-Flow Reverse Osmosis membranes. Inlet pressure gauge - liquid filled. Garden hose connector - 1/2. Inline shut-off valve - 3/8. Detailed instructions and QuickStart Guide. How Does Reverse Osmosis Work? Reverse osmosis (RO) is a separation process that uses water pressure to force a solvent through a membrane that retains a solute on one side and allows pure water solvent on the other side. More formally, it is the process of forcing a solvent from a region of high solute concentration through a membrane to a region of low solute concentration by applying a pressure in excess of the osmotic pressure. This is the reverse of the normal osmosis process, which is the normal osmosis process, which is the natural movement of solvent from an area of low solute concentration, through a membrane, to an area of high solute concentration when no external pressure is applied. The membrane here is semipermeable, meaning it allows the passage of solvent but not of solute. What's in the Package. W e're here when you need us! Y our order is packaged by experts! L ow overhead means low prices! O ur feedback and sales record speaks for itself! Most will go within 24 hours. If you need to use a special carrier i. PR, HI, AK, APO/FPO and US Territories incur a higher rate. International Buyers - Please Note. W e do not mark merchandise values below value or mark items as "gifts" - US and International government regulations prohibit such behavior. International buyers please be aware of the voltage ratings in your country. W e do not accept personal checks, no exceptions! All products are brand new, never been used and not refurbished unless otherwise stated. All images are for illustrative purposes only. Once we receive feedback, you will receive + feedback instantly. If feedback is not wanted, do NOT leave feedback for us and no feedback will be left. 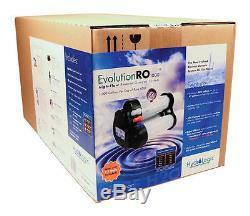 The item "Hydro Logic Evolution RO 1000 Reverse Osmosis System water filtration system" is in sale since Friday, December 16, 2011. This item is in the category "Home & Garden\Yard, Garden & Outdoor Living\Gardening Supplies\Hydroponics & Seed Starting\Other Hydroponics". 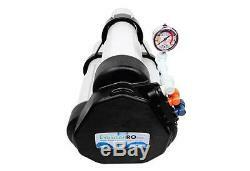 The seller is "thehydrosource" and is located in El Monte, California. This item can be shipped worldwide.